Snowboards come in an assortment of different shapes lengths and looks. Do you want a twin tip or a swallow tail? A jib stick or a powder plank? With at least 100 different board brands out there, finding “the one”, may seem like a daunting task, so how do you go about choosing a board that is right for you? Snowboarding ability – are you just starting out or do you have seasons under your belt? Height and weight – the bigger and heavier you are, the bigger the board you’ll need. Type of Snowboarding – are you a park rat or a powder hound? 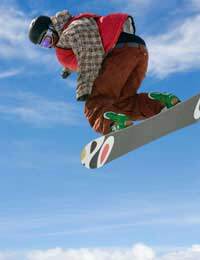 Boards for specific areas of snowboarding like freestyle, alpine racing, or powder are available, but these only have a small share of the total snowboard market. The vast majority of recreation snowboarders like variety, so for this reason we have the “freeride” board. Freeride snowboards are designed to perform well in all disciplines, whether you are busting a back flip off a terrain park kicker, slashing the powder banks after a fresh snow fall, or just cruising the groomed piste with your pals. Unless you foresee yourself spending all of your time in powder, or all of your time in the park, it’s best to opt for a freeride board. If you are new to the sport, you’ll need to choose a board which is soft and forgiving. Beginners’ boards tend to have a softer flex – i.e. they are less rigid and more flexible than advanced snowboards. This comes at the price of some of their responsiveness, but in those early learning days, they allow you to make mistakes without being punished too hard. Intermediate and advanced riders will prefer snowboards that are more rigid. The stiffer a board, the more responsive it is, meaning faster turns and quicker stops. But, this also means that a small mistake is more likely to cost you, so you must be of an intermediate level before you buy a stiffer board. Simply put – the bigger you are, the more board you’ll need. A general rule of thumb is that a board standing on end should roughly come up to your chin. However, this is a rather simple test, as it doesn’t take weight into account. Most shops will have a chart that combines your weight and height to give you the ideal board length for your size. Ladies usually ride smaller, slightly narrower boards, specifically designed for females, that are normally in the 138-157cm range. Guys tend to go for anything from about 155-173cm. The other thing to remember is foot size. Those who have particularly large tootsies will need to go for a wide board to prevent toes and heels from dragging over the edges. Those with hobbit feet should chose a narrow board. When choosing a board, do your research before parting with your cash. Each year snowboarding magazines such as Snowboard UK and Whitelines produce a “board bible” where new boards are thoroughly tested and evaluated. At the shop, ask lots of questions. Most snowboarding shops are staffed by snowboarders who really know their stuff and have a lot of experience in the field. They’ll know what board is best for you, so test their product knowledge! It’s even possible to try out boards before you buy. Some ski resorts and UK snow domes have “demo days” – where you can test out several boards on real snow before making a decision. Don’t buy a board because of the graphics alone. Yes, looks do count, but they should be the last thing to enter the equation. Although it’s tempting to go for that deck which has that funky picture on, you won’t look so cool when you’re on your bum and your friends are leaving you in their snow dust, because you bought the wrong board.